In the last post, Philip Clayton describes the emergence of spirit from a theistic perspective. The following post instead approaches emergence from a secular perspective, focusing on the emergence of successively higher levels of organization in evolution. John Stewart describes the movement from a collection of “isolated, self-concerned individuals” towards a collective conscious “evolutionary awakening” of our interdependence. It is an extract from his book, EVOLUTION’S ARROW: THE DIRECTION OF EVOLUTION AND THE FUTURE OF HUMANITY, that was published as an article called “The Potential of Evolution” in the magazine What Is Enlightenment? John Stewart is a senior labor relations policy adviser with the Australian Government and a member of ECCO, the Evolution, Complexity, and Cognition Research Group at the Free University of Brussels. A major evolutionary transition is beginning to unfold on earth. Individuals are emerging who are choosing to dedicate their lives to consciously advancing the evolutionary process. They see that their lives are an important part of the great evolutionary process that has produced the universe and the life within it, and they realize that they have a significant role to play. Redefining themselves within a wider evolutionary perspective is providing meaning and direction to their lives. They no longer see themselves as isolated, self-concerned individuals who live for a short time and then die irrelevantly in a meaningless universe. They know that if evolution is to continue to fulfill its potential, it now must be driven consciously, and that it is their responsibility and destiny to contribute to this. At the heart of this evolutionary awakening is the understanding that evolution is directional. Evolution is not aimless and random; it is headed somewhere. This is very important knowledge. Once we understand the direction of evolution, we can identify where we are located along the evolutionary trajectory, discover what the next steps are, and see what these steps mean for us, as individuals and collectively. Where is evolution headed? Contrary to earlier understandings, it is now unmistakable that the trend is toward greater interdependence and cooperation amongst living processes. If humans are to advance the evolutionary process on this planet, a major task will be to find more cooperative ways of organizing ourselves. The trend toward increasing cooperation is well illustrated by a short history of the evolution of life on earth. For billions of years after the Big Bang, the universe expanded rapidly in scale and diversified into a multitude of galaxies, stars, planets, and other forms of lifeless matter. The first life that eventually arose on earth was infinitesimal—it comprised only a few molecular processes. But it did not remain on this tiny scale for long. In the first major development, cooperative groups of molecular processes formed the first simple cells. Then, in a further significant advance, communities of these simple cells formed more complex cells on a much greater scale. A further major evolutionary transition unfolded after many more millions of years. Evolution discovered how to organize cooperative groups of these complex cells into multicelled organisms such as insects, fish, and eventually mammals. Again the scale of living processes had increased enormously. This trend continued with the emergence of cooperative societies of multicelled organisms, including beehives, wolf packs, and baboon troops. The pattern was repeated with humans—families joined up to form bands, bands teamed up to form tribes, tribes joined to form agricultural communities, and so on. The largest-scale cooperative organizations of living processes on the planet are now human societies. This unmistakable trend is the result of many repetitions of a process in which living entities team up to form larger-scale cooperatives. 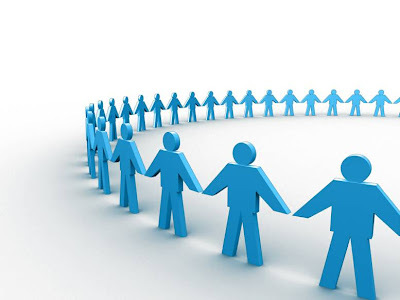 Strikingly, the cooperative groups that arise at each step in this sequence become the entities that then team up to form the cooperative groups at the next step in the sequence. It is easy to see what has driven this long sequence of directional evolution—at every level of organization, cooperative teams united by common goals will always have the potential to be more successful than isolated individuals. It will be the same wherever life arises in the universe. The details will differ, but the direction will be the same—toward unification and cooperation on a greater and greater scale. Life has come a long way on this planet. When it began, individual living processes could do little more than influence events at the scale of molecules. But as a result of the successive formation of larger and larger cooperatives, coordinated living processes are now managing and controlling events on the scale of continents. And life appears to be on the threshold of another major evolutionary transition: humanity has the potential to form a unified and inclusive global society in symbiotic relationship with our technologies and with the planet as a whole. In the process, “we” (the whole) will come to manage matter, energy, and living processes on a planetary scale. When this global organization emerges, the scale of cooperative organization will have increased over a million billion times since life began. If humanity is to fulfill its potential in the evolution of life in the universe, this expansion of the scale of cooperative organization will continue. The global organization has the potential to expand out into the solar system and beyond. By managing matter, energy, and living processes on a larger and larger scale, human organization could eventually achieve the capacity to influence events at the scale of the solar system and galaxy. And the human organization could repeat the great transitions of its evolutionary past by teaming up with any other societies of living processes that it encounters. We are the product of 4.5 billion years of fortuitous, slow biological evolution. There is no reason to think that the evolutionary process has stopped. Man is a transitional animal. He is not the climax of creation. . . .
We are set irrevocably, I believe, on a path that will take us to the stars—unless in some monstrous capitulation to stupidity and greed we destroy ourselves first. The great potential of the evolutionary process is to eventually produce a unified cooperative organization of living processes that spans and manages the universe as a whole. The matter of the universe would be infused and organized by life. The universe itself would become a living organism that pursued its own goals and objectives, whatever they might be. In its long climb up from the scale of molecular processes, life will have unified the universe that was blown apart by the Big Bang.